There is a difference between the botulinum toxin and dermal fillers. The former relaxes the muscles whereas the fillers fill and plump up lines, wrinkles and grooves to make the skin look more youthful. Fillers usually consist of sterile hyaluronic acid gels made from non-animal sources. As we age the skin's natural hyaluronic acid is lost giving rise to the appearance of lines, wrinkles and folds. Injecting fillers into the skin acts to replace the hyaluronic acid that is lost with age. They are also used for lip enhancement and for shaping facial, hand and neck contours. What can Restylane dermal fillers improve? 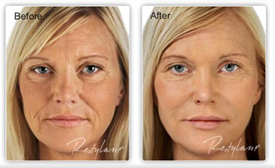 The Restylane range of dermal fillers can fill out lines and wrinkles around your mouth, eyes, nose and forehead. 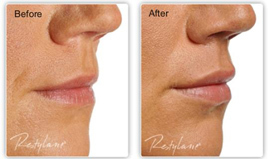 Restylane can give your mouth a fuller and more sensuous form by enhancing the lips to produce a better definition and reduction in lipstick bleed. Your lips can also be given a greater volume and fuller appearance. Restylane is also ideal for contouring and adding volume to the face, for example, cheeks and chin to restore sunken cheeks or a weak chin. Dermal fillers are used to fill in or plump out lines and wrinkles caused by the aging process. These lines can be caused by environmental damage, sun exposure, poor diet, smoking, and exaggerated muscle movement. The fillers are injected into the skin in tiny amounts with a very fine needle and your face may be gently massaged to optimize contouring treatment usually takes around 15-30 minutes, depending on the area to be treated. Some patients have reported they experienced some minimal discomfort but it was not to uncomfortable. Fillers have a lasting result of up to 9-12 months and even longer after subsequent treatments. Derma fillers can be used either as a wrinkle filler, fold filler, cheek filler or for even lip augmentation. The results can be seen immediately and treatment with fillers is safe, fast and leaves no permanent scars or other traces on the face. Fillers can add natural volume in your skin to lift and give it a new firmness resulting in a healthy & vital appearance.